This section takes a look at the medicinal chemistry of herbs; introducing you to the very basics of phytochemistry. We begin this section of medicinal chemistry of herbs by understanding the intrinsic properties of plants. Plants are known good sources of pharmacologically active compounds and lead structures. Artemisinin is an example of an antimalarial lead compound derived from plants. Phytochemistry is a discipline at the interface of botany and chemistry that is concerned with the identification and study of the chemicals derived from plants. Phytochemistry is essentially the study of phytochemicals. 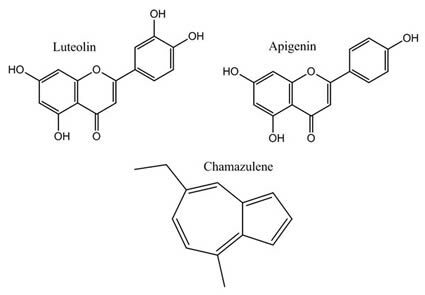 These are chemical compounds that are found naturally in plants. Pharmacognosy is a closely related field to phytochemistry. Pharmacognosy is the study of medicinal compounds of natural origin. These natural sources include animals, microorganisms and plants. Lead compounds and pharmacologically active compounds from natural sources are described in other articles. These disciplines help inform our understanding of other subjects such as pharmacology, therapeutics and lead drug discovery. Certain phytochemicals give rise to properties such as a plant’s colour, odour, or biological effect when consumed. It is important to mention that plants contain numerous different compounds and their combination basically gives rise to the properties. For example, the phytochemical and carotenoid pigment, lycopene is responsible for the red colouration of red fruits and vegetables such as watermelons, carrots, and tomatoes. Botanically, tomatoes are considered as fruit but for culinary purposes, they’re considered as vegetables. Recall from organic photochemistry that increased conjugation generally leads to the lowering of the HOMO-LUMO gap. Lycopene is a highly conjugated molecule that is able to absorb electromagnetic radiation in the visible region of the electromagnetic spectrum. Another notable phytochemical is syn-Propanethial S-oxide. This compound is a volatile organosulfur lachrymator. The enzymes, alliinases are released when onion tissues are physically damaged (i.e. when onions are chopped). Alliinases catalyse the conversion of certain naturally occurring chemicals in the onion to sulfenic acids. Further biochemical reactions lead to the formation of syn-Propanethial S-oxide. This irritant is responsible for the tear-inducing effects of onions. Herbs are no different. Herbs contain numerous phytochemicals. Some of these may be pharmacologically active. Herbs are any phytogenic (derived from plants) substances used in food, cosmetics, cooking, and medicine. With the increase in popularity of ‘alternative medicine’, many herbal mixtures and concoctions have become available. These usually contain an herb as an ingredient. These mixtures are said to treat certain medical conditions. Advertisers often falsely market ‘herbal remedies’ as “nondrugs” and “free from chemicals”. This is obviously not the case. Herbs are plant-derived drugs. One must also be wary as there is a lot of pseudoscience in this area. While many of these concoctions do contain pharmacologically active compounds, the placebo effect is often observed. Despite this, some herbs do contain phytochemicals that have observable beneficial biological effects. As stated earlier, these herbs contain numerous different phytochemicals. Identifying the active principles is a challenge. In some cases, these phytochemicals undergo drug-drug interactions with prescribed drugs. It is generally thought that the constituents of herbs work synergistically. The individual constituents may be identified through spectroscopic and chromatographic techniques. Studying the medicinal chemistry of herbs and their constituents is a challenging task. The individual constituents of herbs may serve as useful lead compounds. Many herbs also contain toxic compounds. As we continue this section on medicinal chemistry of herbs, we’ll look at individual compounds, their chemistry as well as therapeutic uses in pharmacology. Camomile (or chamomile) is an interesting case. The herbal product is derived from the daisy-like plants, matricaria chamomilla and chamaemelum nobile. The two plants have highly similar activities. The active principles of the plants are found in the oil. Bisabolol is the compound mostly responsible for the effect of camomile. Bisabolol has been observed to exhibit anti-inflammatory effects. Other phytochemicals found in camomile includes luteolin, apigenin, chamazulene, and angelic acid. Luteolin and apigenin have anti-inflammatory activity comparable to that of indomethacin. Chamazulene is the compound responsible for the light blue colour of the essential oil. This compound is known to possess anti-allergenic and anti-inflammatory effects. Saint John’s Wort (Hypericum perforatum), a notable drug in pharmacology, is indigenous to Europe but has been introduced to numerous temperate regions on Earth. The plant grows in the wild and is typically found in meadows. The herb is commonly employed to treat conditions such as depression and anxiety. The herb also has a mild sedative effect. Saint John’s Wort is generally believed to be effective in the treatment of mild depression. However, it was shown that Saint John’s Wort is ineffective in the treatment of major depressive disorder (Journal of the American Medical Association). Saint John’s Wort contains many phytochemicals. 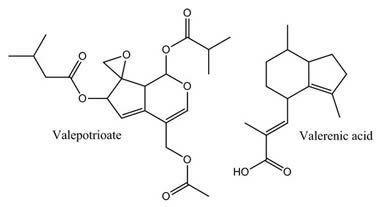 A select few are shown below (Hypericin, Norathyriol & Kaempferol). The herb is also associated with phototoxic side effects. Some of the phytochemicals found in the herb are photosensitisers. J. Am. Med. Assoc. 2001, 285 (15), pp 1978-1986. Garlic (Allium sativum) is one of the most widely used herbal substances used in cooking and in medicine. The plant has been used in herbal medicine for a long time and is widely studied. Many of garlic’s phytochemicals are organosulfur compounds. One of the most notable ones is the cysteine derivative, alliin. Alliin contains a sulfoxide functional group. Just like onions (Allium cepa), garlic releases alliinase enzymes when their tissue is damaged. These enzymes catalyse the conversion of alliin to allicin. Allicin is the organosulfur compound mainly responsible for the distinct odour of garlic. Allicin is known to have some antiprotozoal, antifungal, antibacterial, and antiviral activity. Garlic is claimed to treat numerous medical conditions. However, some of the claims lack concrete scientific evidence. The aloe vera plant, colloquially known as ‘the wand of heaven’, is an example of a plant used in herbal medicine. The plant is popular in alternative medicine. While many proponents of alternative medicine claim that the aloe vera plant has medicinal properties, currently there is little scientific evidence to support these claims. The leaves of the plant contain compounds such as anthrones, anthraquinones, and acetylated mannans. Many of its phytochemicals are currently being investigated to show if they truly possess pharmacology activity. With this type of activity in mind, let’s continue our analysis of the medicinal chemistry of herbs by looking at one of the most famous examples; that of the foxglove. Foxgloves are Eurasian plants of the genus Digitalis. Herbal preparations of foxglove were formerly used by herbalists to treat heart conditions. The use has ended because of the narrow therapeutic index of the preparations. The cardiac glycoside, digoxin is one of the active principles extracted from certain species of Digitalis. Liquorice is the herbal product derived from the root of the plant, glycyrrhiza glabra. The plant is a perennial shrub found in the Mediterranean region and some parts of Asia. Liquorice has been documented in ancient Chinese writings and was actively used in the Roman Empire. The herb contains compounds such as sugars and triterpenoids. Glycyrrhizin is a steroidal triterpene glycoside. The root of the plant contains up to 9% of this phytochemical. The compound is converted in the body to a pharmacologically active compound, glycyrrhetic acid by intestinal flora. To some extent, both glycyrrhizin and glycyrrhetic acid exhibit anti-inflammatory activity. Glycyrrhizin is also thought to cause gastric mucus secretion. This is thought to be the origin of liquorice’s antiulcer properties. This phytochemical has demonstrated antiviral activity during in vitro and in vivo studies. 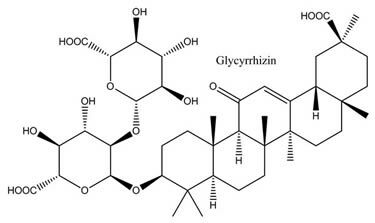 Glycyrrhizin has been used as an anti-hepatitis C drug in Japan. Valerian (Valeriana officinalis) is a perennial angiosperm that has a characteristic sweet odour. The plant is native to Europe and certain parts of Asia but has been introduced and cultivated in North America. The herb is known to have sedative effects. It is currently unclear which compounds are responsible for the sedative effects but it is thought that the active principles interact with the GABAergic neurotransmitter system. Some of the compounds present in valerian include valepotrioate and valerenic acid. Ginseng can be derived from the dried root of panax quinquefolius (Western Ginseng) or panax ginseng (Asian Ginseng). These two highly similar species produce unique phytochemicals of the genus Panax. These compounds are known as ginsenosides. Some of the ginsenosides have been successfully isolated, purified, and studied. Interestingly, it was found that two of them have opposing pharmacological effects. Ginsenoside Rg-1 is a CNS stimulant whereas ginsenoside Rb-1 was discovered to be a CNS depressant. Ginseng is regarded by some as a cognitive enhancer. However, studies conducted comparing ginseng with placebo showed statistically insignificant improvement. Some also regard the herb as an aphrodisiac, stimulant, or a cure for sexual dysfunction in men. Verbena (commonly known as vervain) is a genus of perennial or annual angiosperms used as herbs. Monoterpenes and sesquiterpenes are some of the main phytochemicals. There are claims that vervain is useful in the control of cancers. However, there is no scientific evidence to prove these claims. Wolfsbane plants (genus Aconitum) are herbaceous plants mostly found in mountainous regions of the northern hemisphere. Most species of wolfsbane are toxic. 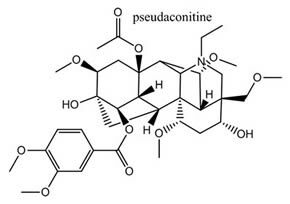 For instance, the roots of aconitum ferox contain an acetylcholinesterase inhibitor, pseudaconitine (nepaline). Despite this, wolfsbane is used in herbal mixtures. Feverfew (Tanacetum parthenium) is a perenial herb native to the Balkan Peninsula, the Caucasus, and Anatolia. Cultivation of the herb has spread to certain parts of South America, Europe and North America. The herb has been used since ancient times to alleviate fever, migraine, and arthritis. However, scientific studies suggest that this is due to the placebo effect. Feverfew is thought to inhibit prostaglandin synthesis through a COX-independent mechanism. Parthenolide is generally regarded as the main active constituent of feverfew. Another phytochemical found in feverfew is the pentacyclic compound, canin. Rhubarb roots (rheum rhabarbarum) are commonly used in Chinese herbal medicine as a laxative. The root is rich in cathartic and laxative anthraquinones such as rhein and emodin. These molecules were used as lead compounds for the development and design of the laxative, dantron. This concludes this article on the medicinal chemistry of herbs. The natural products found in herbs are highly diverse. Some of them may have beneficial effects while some of them are dangerous to humans. Often the combination of the phytochemicals found in herbs work synergistically. As shown above, there is still much that is not known about the chemical and pharmacological properties of herbal preparations. There is a need to know which compounds are responsible for the observed effects and if they demonstrate synergy. There is also a need to show whether or not certain herbs truly have beneficial effects. 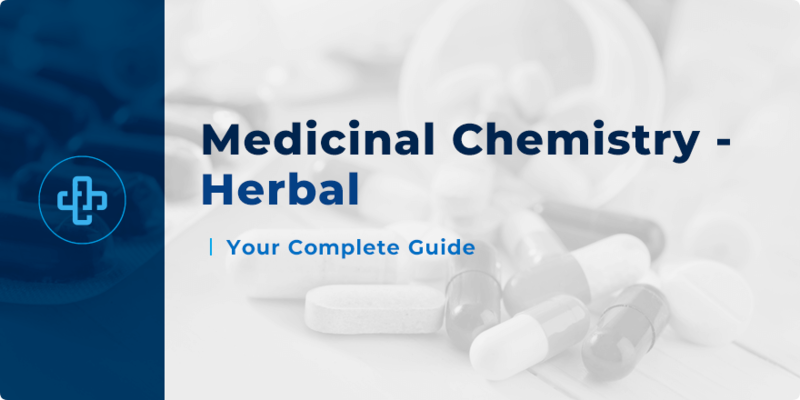 This completes our introductory analysis of the medicinal chemistry of herbs. As we have studied, the intrinsic properties of plants render them ideal lead compounds in our search for a novel therapeutic drug. We looked at some of the more well known examples, analysing structures as well as understanding how these structures translate into therapeutic activity.